Are you new to coaching soccer?STOP!! I strongly urge you to go to my NEW SOCCER COACHES PAGE before proceeding. This page is designed with the "volunteer" parent/coach in mind and is a must read for the first-timer at coaching youth soccer. When it comes to free help for soccer coaches, you can rest assured I have done my homework - I mean surfing. I have also weeded through the online resources and have developed a page on how to organize a soccer practice. This page shows recommended online manuals for coaching, drill resources, and how to develop your own practice plans. You want a quick resource for coaching soccer? How about some downloadable help? It doesn't get much quicker than this! I have personally used these resources myself and wish that I had found them when I started coaching. This information will get you up to speed FAST while giving you a solid foundation upon which to build. Also, you should go to my soccer book page and read the soccer book reviews before buying a book. The Novice Coach - An Introduction to Coaching Youth Soccer (DVD) - The ideal soccer video for any first time parent/coach of very young soccer players.Learn how to organize and conduct training sessions for Under-6, Under-8, and Under-10 boys and girls. Downloadable companion booklet. produced by Marty Schupak. The best selling " Championship Soccer Drills" has some of the best drills around including over 20 shooting drills and much more. The at home DVD "Backyard Soccer Drills" shows numerous creative and fun drills that players can do by themselves or with friends. And the classic "34 Soccer Goalie Drills" DVD has been used by players from the youth level all the way up to the professional level for players who want to improve their goal keeping skills. ‘Soccer Shooting Drills" has some of the most popular shooting drills as well as some in depth views of the shooting technique. There are also other very good videos to consider for coaching soccer. I personally like to have a hard copy of information for coaching soccer. (No, don't bug me about being a tree killer.) While the videos from the Soccer Vault are great, I recommend at least one book on drills or on coaching youth soccer as a supplement and to take to the field. A good place to start is to browse through my soccer book recommendations. Another well known resource is Amazon.com. They have a surprisingly vast amount of resources on how to coach soccer. Below is an example of a search done on soccer coach. Another great resource is a soccer dry erase clipboard The absolutely CHEAPEST and BEST one I could find is the one below. 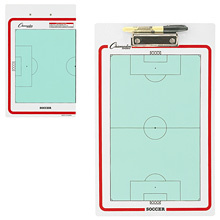 Work out your plays with Champion(r) Sports Soccer Dry Erase Clipboard. With a full field view on one side and a half field on the other, you are equipped to demonstrate the winning play. Each board includes a dry erase marker and easy wipe-off surface. Ideal for coaching soccer! Another great idea is the Kwik Goal Soccer Coach's Kit available from Amazon.com. I included a picture and link on the right side of the page. This kit comes with a whistle, clipboard, rulebook, and scorebook. A great gift idea! Don't forget that I am cheap - I mean frugal. Yea, frugal. That's it.